This post uses affiliate links(click here for more info). I earn a commission from your purchase. Thank you for supporting Whistle and Ivy! We don’t have a large celebrations of Valentine’s Day in our house. The Boy isn’t in school yet, so there’s no need to spend weeks planning Pinterest-perfect Valentines for his classmates, but I do think the sentiment is nice, and there’s nothing wrong with reflecting and thinking about ways we can better show our love to our family. So in that way, I am not a total Valentine’s Day Grinch. But even if you are, this Puppy Love Heart Slouchy is a super cute and comfy slouchy that can be worn all winter long. Plus there is Toddler version too! 3-dc cluster: Yarn over, insert hook. Yarn over, pull through st (3 loops on hook). Yarn over, pull through first 2 loops (2 loops remaining on hook). Yarn over, insert in same st. Yarn over, pull through. Yarn over, pull through first 2 loops (3 loops remaining on hook). Yarn over, insert into same st. Yarn over, pull through. Yarn over and pull through first 2 loops. Yarn over, pull through all 4 remaining loops. If it’s easier to understand, it’s a basically a dc3tog worked all in the same st.
2. Ch 2. Hdc in same st. Hdc 4 in BLO. Hdc in last st, going through both loops. Turn. (6 sts). Don’t tie off after last row. Repeat row two until your band reaches about 18″ – 19″ for adult. You will get this measurement by gently stretching your band and measuring the length, not the pre-stretch length. You want the hat to be snug and due to differences in yarn stretchiness, I am not providing a row count. Instead, use your measuring tape. Don’t break yarn. 1. Fold the band in half, and using the loop from the last hdc, pull it through and sl st down the side, forming a band. Don’t tie off. Turn the band, so the seam is on the inside. Beginning where you left off sewing the band: Ch 1. Sc in same sp. From here, you will sc around the band. Work approx. 3 sts for every 2 hdc rows, until you have 72 total stitches. Join with a sl st with the first st, using 2nd color. 5. – 13. 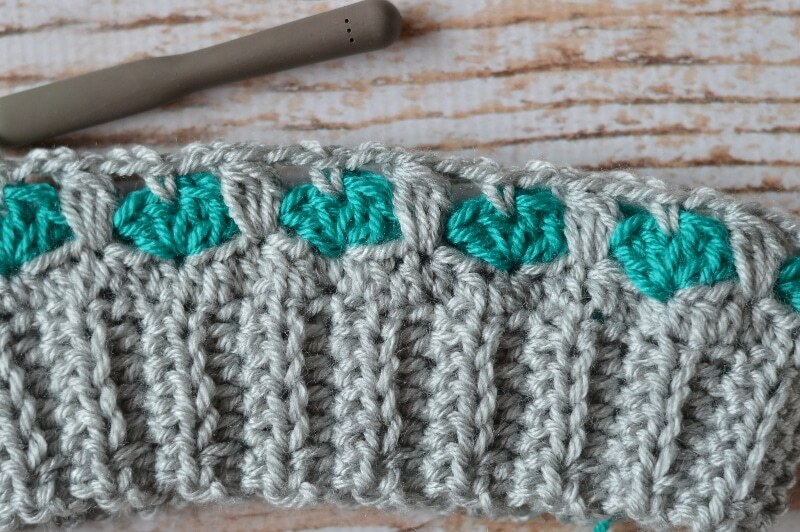 Repeat rows 2 – 4 respectively, changing colors when you make the hearts row. 16. Ch 2. Dc2tog all around. (24 sts) Tie off. To close the hat, turn it inside out. Put a length of yarn on your needle and sew in and out each stitch across the top. Pull it tight, cinching the top closed. Tie a very sturdy knot and clip end. 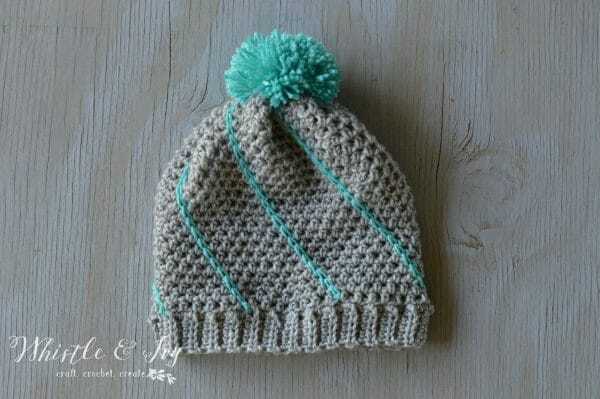 Finish with a pom pom on top (get the tutorial here). I was given an amazing sugar cookie recipe from a family friend, so I think The Boy and I will make and decorate a delicious batch of heart-shaped cookies on Valentine’s Day and deliver them around the neighborhood (one of his favorite things to do). Don’t miss the Toddler Version! Be sure to follow on Facebook and Pinterest, and don’t forget to subscribe so you don’t miss any free patterns! Show off your stuff! Join the Whistle and Ivy Facebook Page. What do you do on Valentine’s Day? Love this!! I just finished making my first one. Do you have any tips on how to make the hearts more heart shaped? Your hearts look much more like hearts than mine. Why are they called puppy love? It’s just a name I made up, because of the little hearts. Can this stitch( puppy love) be made into a messy bun hat? I made the scarf and would love to try it in a messy bun hat style. Hi my name is Rhonda and I was wondering if the Puppy Love beanie could be worked with a FPDC and BPDC band instead of the ribbed band? Hi Rhonda! Yes you can do that! I would start with a dc foundation of 72 sts, join, then work the fpdc and bpdc ribbing. Then follow the pattern to finish. The actual length. Please note, the length is only accurate before stretching it to see if it fits your head. You do want a snug fit, though. I made one of these (intended for myself) but my 2 girls loved it soooo much, that I never got to wear it! I am definitely making more this winter. You are awesome! LOVE your patterns! I posted pictures on my blog (mellowmusings.com) linking back to your site. Love, love, love! I have just started enjoying your patterns. Keep them coming. Wanted to tell you I am a big fan of all your designs, you create such beautiful things! I have done the slouchy hat and the boat shoe slippers and I must tell you I had absolutely no problems with following your written instructions. I personally found them well written. I thought you should know that. Thank you for taking the time to let me know, Lisa! You are so kind! Curious, have you seen the “Striping Shells Hat” over at the redheart.com site? I must say, I like your design so much better for some reason. I haven’t! It must be similar? With the exception of the brim (which was FPDC) it was exactly the same. At first I thought it was you until I saw the designer name that was listed for the pattern. Can I send a pic of it to you? Is it on their website? I can take a look. Yes, it should stretch 4 inches or more. But changing the stitch count works too! Omgeez! I just finish making this hat with the pompom for my 7yr old and it came out beautiful! She loved it! Thank you so much for the pattern and the clear precise instructions with pictures. You Rock! Yay! You’re welcome, I am SO glad you love it!! I did the 39 rows for the band. H hook and med weight yarn. NO way this will fit and I have a small head. Super cute pattern though. Did you meet the gauge? Had to use a j hook :) thank you! Cute pattern! Hi Bethany and thank you for this lovely pattern. I’d love to see a You Tube video for this too and/or more photos of the steps. I’m also really struggling with the 72 stitch count. Did you day this should actually be 60? Okay! I will get that on my channel as soon as I can! It’s 72, then the following is 60. One section 2 of body should there be a total of 12 hearts? i finally got this made after frogging 5 different times in different places! sorry but i was wondering if this is a draft and NOT the finished pattern as there are many errors and omissions! :( this is the 3rd pattern now of yours i have made and struggled with :( you have such cute designs, but really need to be thorough in explaining with maybe some pics on harder to explain or confusing rows/rounds. just a suggestion. Can you be specific about which parts you struggled with? And which other patterns did you struggle with so I can look at those as well? Ive struggled with picking up the stitches after making the the strip into a band. I couldnt seem to work up which bits i needed to crochet in and which to miss which made getting the 72 stitches a nightmare!! I gave up and improvised, the same with the round of single crochet after the first two rows of pattern. Dont know if this is the same problem as anyone else?? Sorry you struggled, I tried to explain the best I could, did you work an increase approximately every 6 sts? Sorry for the frustration! What do you mean “pick up”? So when it turns on its side, I didn’t understand how to know what what a stitch and what wasn’t so what to crochet into and what to leave as I didn’t need it. Not sure if that makes more sense? Well since there aren’t any stitches, you just find an area to work into, there really isn’t a right or wrong place. You can pick spots that are relatively evenly spaced (as normal stitches would be placed), then increasing every 6 should get you close to 72. Are the hers supposed to line up? My second color of heart line up with the first ones and the picture doesn’t look like it’s supposed to. No, they should be offset. Are you working the slip st at the beginning of the round? In #5, it says to sl st 6. Am I doing a sl st in each stitch or 6 sl st’s in the same stitch? You are doing 6 sl sts each in a different st. I had the same problem my finished hat fit my 1yr old I recommend doing the band to fit your head then adjust the pattern to fit your needs. times 12 == 60 stitches. Is this correct?? I appreciate you giving the stitch count. It helps to know if I have gone astray..watch it closely. So glad you help us get the correct yarn and I did get mine from your link. It is a real service to us. Oh dear. There is the problem, the stitch count is indeed 60 (like on row 2). I am so sorry my mistake has caused your problems! Did you buy the PDF? Send me an email from my contact page, including the email you used to purchase it, and I will send you an updated one straightaway. My apologies! Love your patterns!! Thanks for sharing. 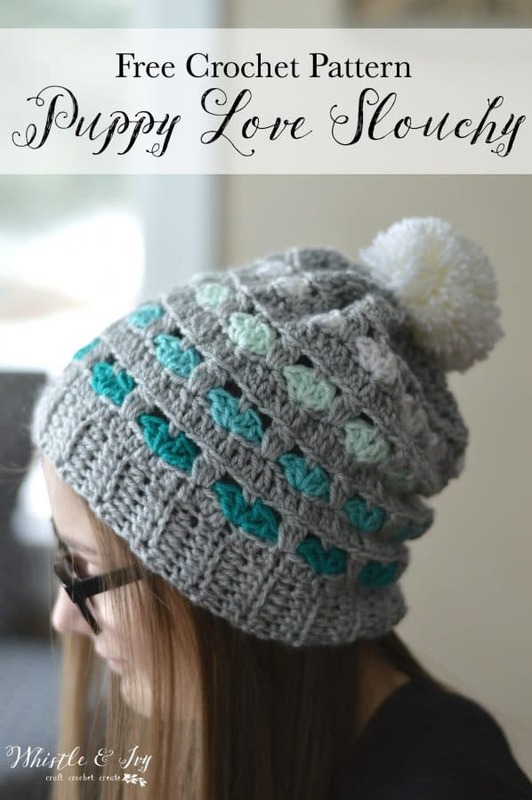 I need help with step 5 on Puppy Love Hat for adults.I cannot get the stitch count of 72, as the pattern says. Mine is much less. Also, it says Dc4 in same st, then Dc 4. All other, there is a Ch1 between the groups of DC 4. Should there be one here also? Yes! Thanks for catching that, I have made the change. How many stitches short are you? Are you counting the chains? 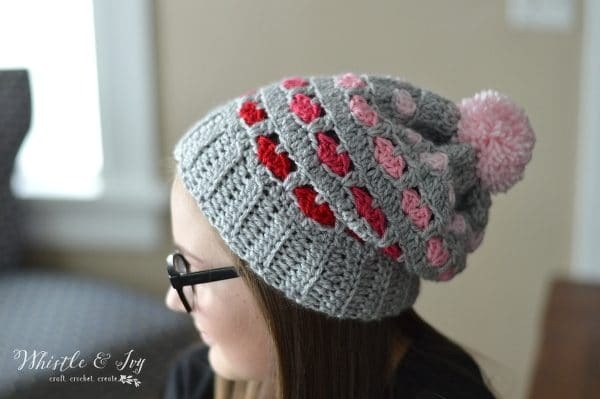 Such a beautiful hat…It is on my to do list for my Granddaughters..How would I make for a 5 and 7 year old? Thank you! I think working the Toddler Puppy Love Hat with a larger hook would be the easiest way. I love this hat! Thanks for sharing the pattern. I have some family members who don’t like slouchy hats. 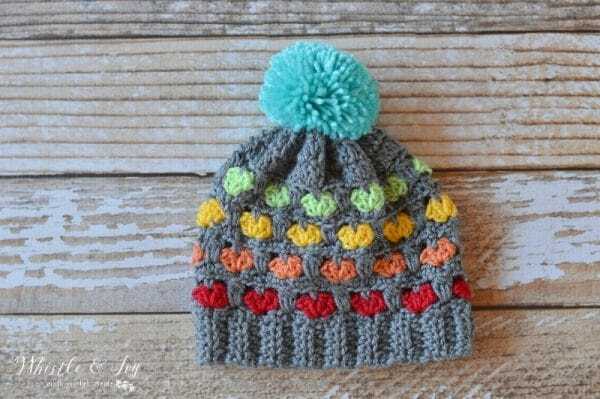 How would the pattern be changed to make it a beanie? It should work if you made less rows so it is not as tall. I’m guessing you mean to make less rows before you start decreasing for the crown part of the hat. Is that correct? Thanks! Haha! Thanks so much! I hope you give it a try. just started making this and have a quick question please. On body row 4. Ch2. DC in same stitch. DC in each stitch around. So on previous row you do Ch2 between stitches do you do 1Dc in each Ch2 space please? No, you work a dc in each st around. The chains are each a single stitch. Let me know if you have more questions! Hello! 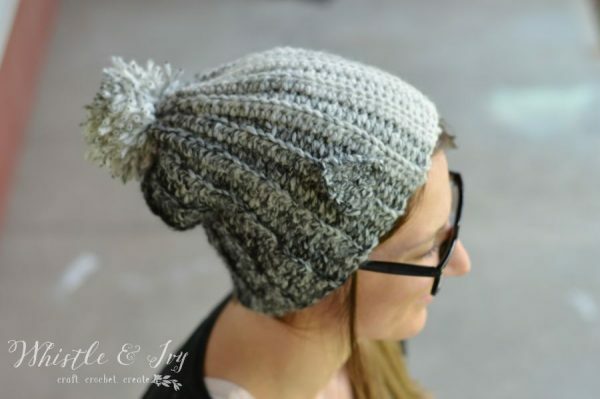 I am wanting to make this hat. It’s super cute! I was just wondering approximately how much yarn is used, mostly for the main color. I am thinking one skein, maybe 150 yards or so? Thanks! Thank you! Less than one skein! I am not positive on the yardage, I can’t bring myself to pull out all my work for an exact measurement! Less than one skein though, for sure. I think this hat is beautiful! I made one, but my yarn was also a bit thinner, so it’s more like a beanie. It looks great, though! Do you have a policy on selling items made from your pattern? Thank you! I would jlike a link-back that the pattern is mine. You are free to sell what you make! Thank you very much! You are very welcome! Adorable!! How could I make this for a 12 month old? Thanks! I haven’t made a size that small so I can’t say in detail. You will need to do less rows on your bad, and then go down from the number on the original hat in multiples of 6. 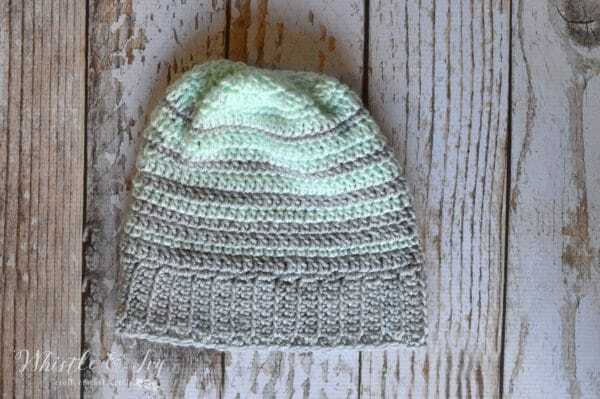 Definitely adding your slouchy hat to my to-make list! It turned out so adorable! I shared it on Pinterest and Twitter. These are so darling! Thank you for sharing. 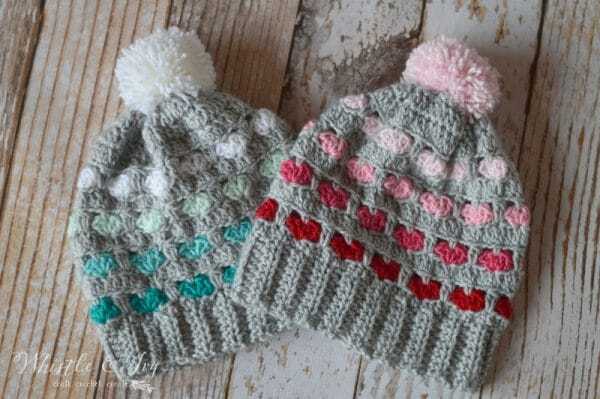 Is the paid pattern the exact same as this (teen and adult) or does it include for child sizes? I want to make this for my 16 month old god daughter. Thanks! The hearts do decrease the stitch count, but the row that turns the shells into hearts brings you back to your original count. 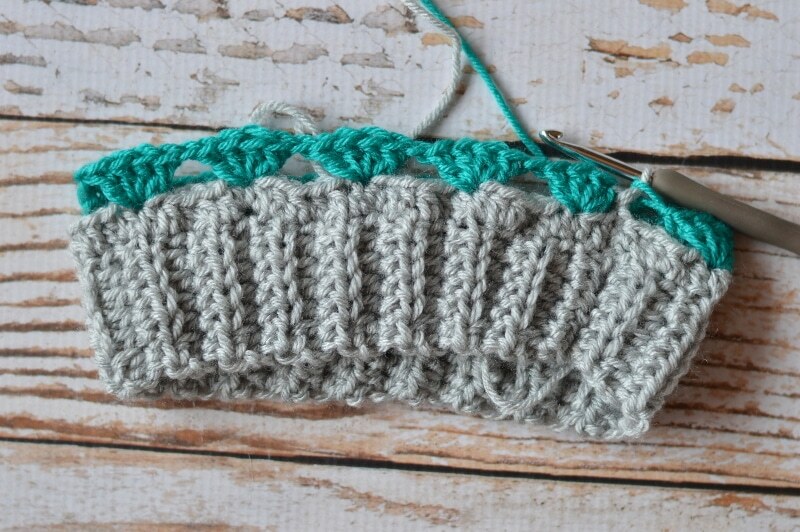 Are your row stitch counts correct? Love your patterns, thanks so much for sharing. I have a question. Is this hat intended to be sized for a child, or am I having to compensate for the yarn I’m using? I’m using Caron Simply Soft, it is labeled 4 – medium weight, and an H hook as instructed. I did the 39 rows for the band, and there is no way it would fit my head once I put it together. I can add extra rows if needed, I just wanted to check and see if the 39 rows was possibly a typo, or just my yarn of choice causing me the problem. Thanks, love this hat! Hello! Thank you! No it’s not a typo, you will need to compensate. Caron does say 4 on the label, but I find it to be more fine than other medium weights. Doing more rows can be tricky. Be sure when you do your first row of the body that your number is in multiples of 6 (72, 78, 84) so the heart row will work out. is this right in pattern from row 2 to row 39 ??? You are repeating the same instructions for row 2 for a total of 39 rows.